Preheat the oven to 200°C/400°F. Halve the plums, remove the pit and cut into wedges. Place in a baking dish. Combine plum juice with port wine and sugar. Add the cinnamon stick. Pour the mixture evenly over the plums. Turn the plums in the sauce and bake in a preheated oven at 200°C/400°F for approx. 30 min. Bring rice milk to a boil. Add the rice and vanilla seeds. Simmer for 30 min., stirring occasionally. 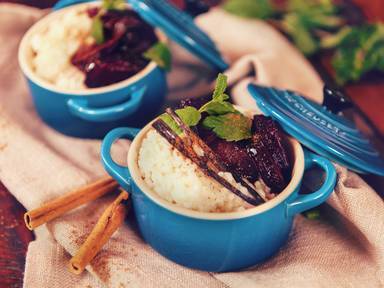 Serve the rice pudding and baked plums warm with a pinch of cinnamon.